Fred (label) is the brainchild of Fred Mann. Following the success of his contemporary art gallery, Fred [London] Ltd Mann decided to look at his other great love, Music. The label will work as a sister company to the gallery and, like the gallery, will respond in a close knit and creative way to the recording artists it seeks to nurture and promote. FRED has been set up to record, produce, distribute and promote new music by a wide range of artists. The label, unlike a large slice of the established indie or major labels has the luxury of being able to respond to projects by different recording artist as and when they come up. Rather than setting out to release rock, R&B, classical or pop, FRED will cross musical genres. Despite the variety inherent in how the label will work, FRED has a commitment to quality of the first order and to encourage innovation and experimentation throughout our releases. To celebrate this spirit of diversity, our first two releases will be suitably wide reaching. FRED has been set up during 2006. Whilst beavering away recording and planning our releases, we noticed that the music industry is changing. Global brands and multi nationals have been challenged by downloads, and small, creative projects. It seems to us that the time to do something personal, detailed and above all lead by ideas was right now! The whole project was kicked started by New York art rocker, Guy Richards Smit who asked Fred Mann to help sign his band to a cool independent label. One month later Mann had set up Fred (Label) LTD and contracts were drafted. Finding himself with a label and one recording artist, Mann cold called his favourite English soprano, Catherine Bott (right) and nervously asked if there was an album she had always wanted to make but had never had the chance. After a long lunch chatting through ideas firm plans were made and the label began to take shape. Future plans include an album of music in response to the sculptures and poetry of Cathy de Monchaux by Pop legend Martyn Ware and a compilation to celebrate the history of the Colony Room Club in Soho. Fred Mann has had a mixed and colourful career that has included everything from DJing at Glastonbury, running illegal nightclubs and raising money for arts education in East London schools. After he finished studying sculpture, he worked art directing music videos, and making films, before exhibiting his sculptures as an artist. After a long association with rebel art gallery Milch, he took over as co-director in 1996. He then ran a contemporary are gallery partnership in Hoxton from 2000 ­ 2005, before setting up his first solo gallery project FRED (London) LTD in 2005. He has now opened his second gallery in Leipzig, Germany at the invitation of Judy Lubke of Eigen + Art. Having his own record label has been on his mind for many years. Well, that's the Fred PR blurb, so what about the music? I stumbled across the label through their first release, Convivencia featuring soprano Catherine Bott (below), which hit the streets on November 1. Let's get the weird bits out of the way first. 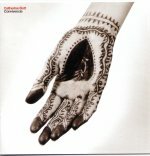 The very distinctive sleeve design is below, the hand decoration by Riffat is an example of the Indian art of mehndi. If you can't read the title of the album in my image don't worry, you can't read it on the sleeve itself unless you use a magnifying glass. You won't find any description of the music on the sleeve, and when you get inside you won't find any track or overall timings, the typeface for the notes is tiny, and if you want them in any other language than English forget it. The disc is produced by Stephen Henderson (who also plays on the CD, see below) and Catherine Bott, with Steve Price engineering. Recording venue was Angel Studios which is a former United Reform Church in Islington, London. It is an excellent studio, but the sound on Convivencia is a little dry and close. This may be to accomodate the spoken tracks, but it does not compare well with the signature sound that Alia Vox achieve on similar repertoire in more resonant acoustics such as the Collégiale du Château de Cardona which was the recording venue for Orient-Occident which I wrote about recently. Now if you think this is shaping up for a seriously negative review you are quite wrong, Convivencia is one of the most innovative, challenging and ultimately satisfying new CDs I've listened to this year. Convivencia is the Spanish word for living together harmoniously, and it was also used to describe the co-existence of different faiths in medieval Spain. Iberia was under Muslim rule for more than 700 years, and the final re-establishment of Christianity resulted in exile or conversion for many Moors and Sephardic Jews. The collection of songs and poems on the CD is taken from the 11th to 16th centuries, and mirrors the cultural melting pot that was medieval Spain. (Many common Spanish words are derived from Arabic including ¡Hola! and azúcar). 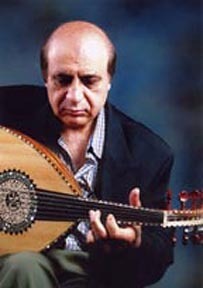 Convivencia certainly delivers innovation and experimentation with its mixture of song and prose, and Spanish and English, and also crosses from classical to World Music with an eclectic instrumental mix of vihuela, lute, guitar (all played by David Miller), oud (Abdul Salam Kheir - above) and tar, tablah, tbilat and douf (Stephen Henderson). But the real star is Catherine Bott, who is also a presenter for BBC Radio 3's Early Music Show. She turns this extraordinary CD into a double celebration of the wonderful music and seductive langauge of Spain. This new label's first release may be weird, but it is also a remarkable achievement. Perhaps I am weird as well, but for me this bold new venture shows that there is a future for the classical recording industry beyond established rock stars 'discovering' John Dowland. * With many thanks to the indefatigable Andrew Cane at Prelude Records who actually managed to find me a copy of Convivencia. If you can't find a copy just contact Andrew.